That is a beautiful vehicle and a very impressive conversion! Very, very nice! Looks like a well thought out and extremely well executed conversion. Since the last post I have been busy and fitted a 23ltr water tank in the passenger door unit with a small demand pump and a curly garden shower hose and head at the back door. We discussed having a sink and taps but after much deliberation decided to forgo fitting one as we rarely used the one fitted to the previous 110, and my partner wanted some flexibility with where to cook. The system works very well, with a small pump and simple on off switch. I mounted the gas bottle under the outside of the Left rear wing in the same fashion as with the Dormobile set up. its out side so no worries about gas collecting in any lockers. I have fitted an on/off switch inside the vehicle by the rear door, and a bayonet connect for the hose so as we can cook inside or outside the vehicle as needed. The cooker is stored in the long box in the back and can be placed where ever needed. 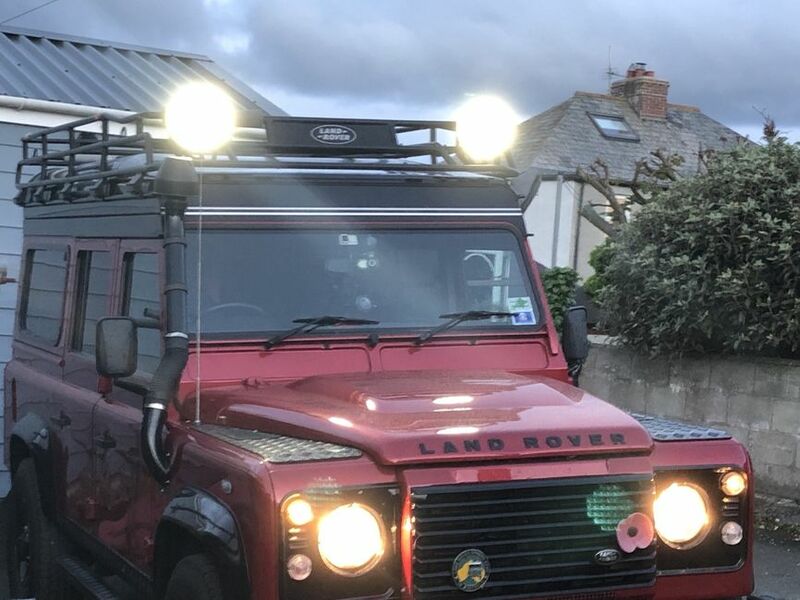 I added a strip of small LEDS around the lower bed frame to illuminate the rear which work very well - cheap as chips and perfect for the job! 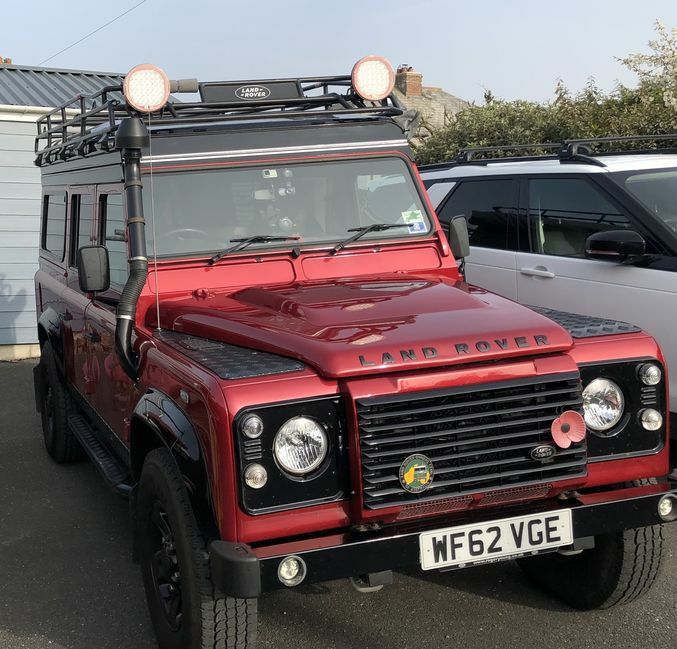 Rear door and window grills added to the back to help with security and to hang things too, courtesy of another forum member here - (cheers! !, and after the Peterborough landrover show, have added a rear door stay (that is amazing !!) along with a remote control for the cab heater (- which means we can turn it on without getting out of the bed !) And some thin rubber matting to protect the tops of the units was another bargain! From various stands at the show I bought a set of Jate rings for the front recovery points, padded magnetic window blackouts that work very well, some upgraded security measures, and a set of sand tracks, which will be mounted over the drivers side rear window some time in the future. An upgrade to the bed mattress in the form of a double thick self inflating Kip Matress meant that my partner can have the 2 singles for her D5 to use when needed. We have used the vehicle numbers times over the summer and all in all its been VERY good! The 270 TufTrek awning and sides work really well - but are still a little tight to fit one pole at times - but have discussed that with them and know how to fix that. Off camping in the Peaks soon so more picture and reports soon. I'm considering a pop top for our conversion, how do you find the x vision x set up compared to a doormobile? Is the restriction with the x vision x over the doormobile in space availble when they are opened a negative for you or something you have gotten used to? We looked at a number of options and various pop tops, and X-vision-x ticked all the boxes for us, being the lightest, having the lowest profile and cost, as well as retaining a standard roof rack. Alucab icarus was a real contender but is much heavier and higher than the X-Vision-X, and had a solid bed board. The Dormobile roof is a sideways opening pop top with a lot of canvas involved, and only recently gone for a full base bed area. Benefits of the dormobile is that its a full length pop top so you can stand up in all areas of the cab, its very bright inside due to the canvas, and they have a version for a 90 that works very well. 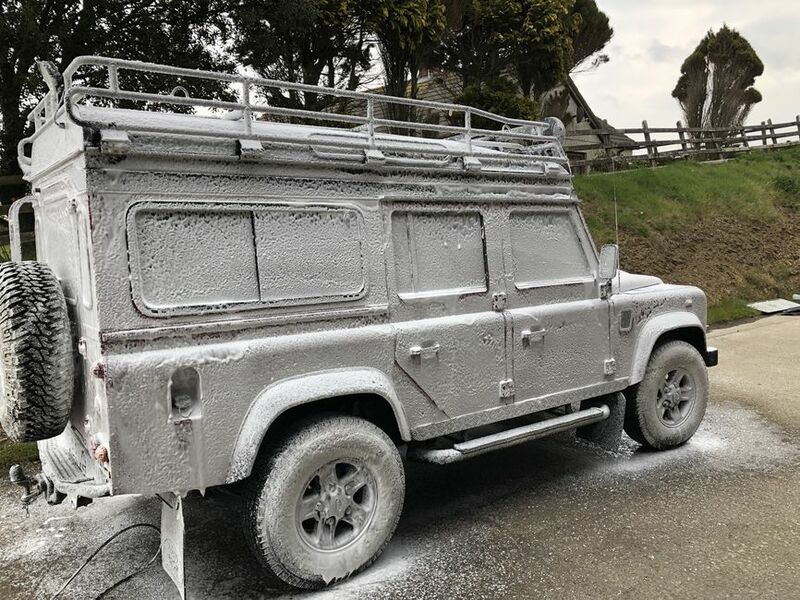 We never had a dormobile roof fitted to our previous 110 as we needed a roof-rack for carrying our canoes, and the dormobile set up prevents fitting a rack due to its mode of operation and being made of GRP. We don't notice any restrictions with the x-vision-x roof, as we can stand up in the back and not touch the roof with the bed up, there is a place to stand when getting changed and into bed, and we can still use the area under the bed when its down. When in bed its not cramped and has plenty of fresh air, and the slatted bed allows heat from the cab heater to warm the bottom of the mattress keeping us very toasty at night. there is a version of the X-Vision-X that has a front opening to the pop top too that makes a very high ‘W’ shape so as you can sleep with your heads over the driver seat as well ... its very popular but again reduces the use of a roof rack. Each type of roof has pros and cons and we choose ours to suit our style of camping and traveling. Lovely reply, it's cleared up some thoughts i had. I think i will go with a pop top from Dormobile, the x vision x and icarus are nice, but costs are too much for what i'll gain ( the sleeping area and use of a roofrack ), whereas the extra head room from the dormobile is what i primarily want. I'll work on a double bunk set up to intergrate into what i've already built after the pop top has been fitted. Finally got to fit the raised air intake .. just need to touch up the paint on the securing bands ... Supplied by a real gent on here ! Obtained a great set of cushions from our old Ikea chairs .. getting them cut to fit and covered. Have managed to obtain the materials to make the pop top door flap vent now ..2 long zips and the water proof fabric as used on the top.. so that will be made some time in the next couple of months. Been used a lot recently, Pentilly castle, beach picnics, nights out etc.. it even had a wash and brush up ! 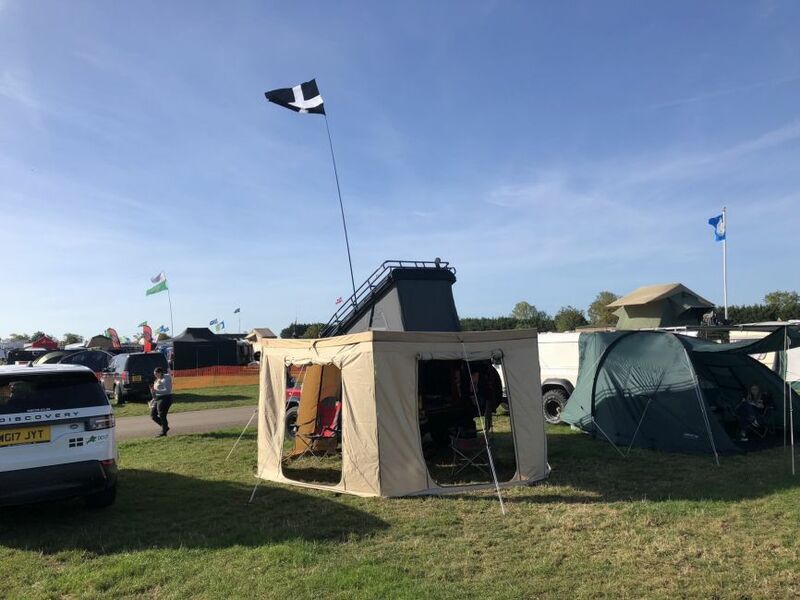 Met up with Robin and Kim at the Penitlly castle and shaped a few ideas with the pop top and set up as they have been using their 110 for the last year with a similar pop top set up as Poppy . So we are all ready for the trip to Slovenia in the summer ... time for its real shake down.!! Wired in the spot lights with some great help from the forum members ! your very welcome Being a sewage diver at least I know how deep the 💩 will be at work today.